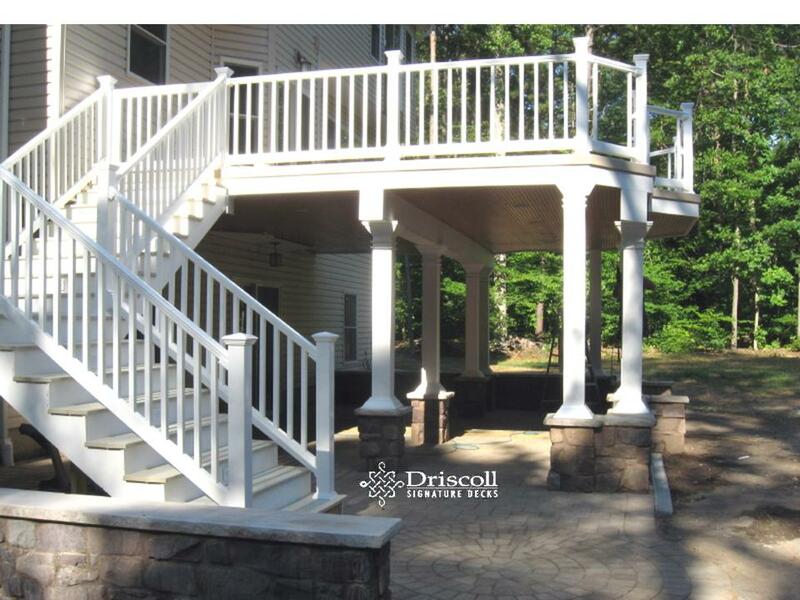 Info:This Driscoll Solution Story is an Atlantic County Decks that offers a upper fiberglass deck with white vinyl clear-view railings, a platfrom stairs, accent lighting on the posts and risers and a paverstone patio below with a stained-vinyl beadboard ceiling, high-hats lighting and a couple of paddle fans - to keep cool! When we arrived at this beautiful new house, we found that the builder left not only his ‘signature’ steps to nowhere, but he also left a little railing on the 2nd floor to ‘secure’ that sliding glass door, just in case someone inadvertently opened it. Amazing..! 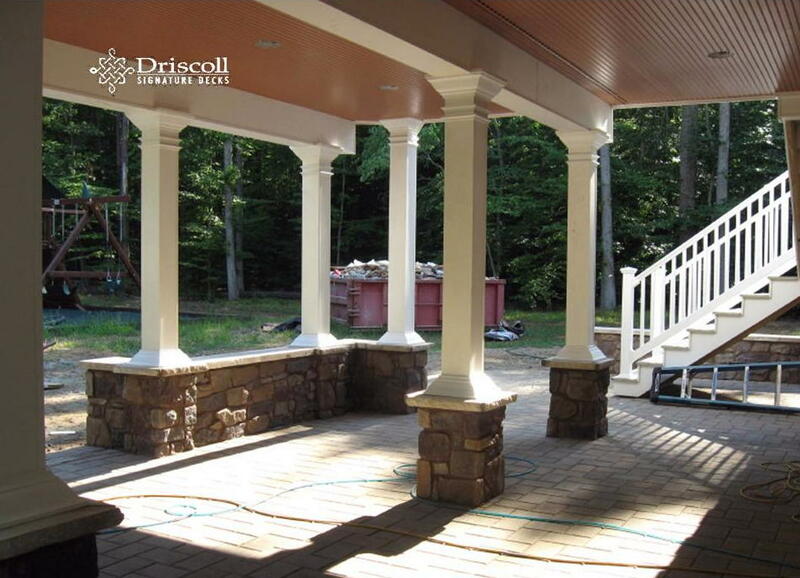 You will find quality deck designs, consultation and excellent craftsmanship when you search for Driscoll Signature Decks at Deck, Decks, Deck Builder, Deck Contractor, Decks NJ, Deck Builder NJ, Deck Contractor NJ, Atlantic County Decks, Decks Atlantic County NJ, Deck Atlantic County, Deck Atlantic County NJ Atlantic County Decks, Atlantic County NJ Decks Atlantic County Deck, Atlantic County NJ Deck, Deck Contractor, Atlantic County, Deck Contractor Atlantic County NJ, Atlantic County Deck Contractor, Deck Builder Atlantic County, Deck Builder Atlantic County NJ, Atlantic County Deck Builder, Atlantic County NJ Deck Builder, Atlantic County NJ Deck Contractor. At first we tried a deck design to incorporate the stairs down from that 2nd floor door, but thankfully it was just too far from the main deck area and although circular stairs would have fit best, spiral stairs are not our favorite design because they are too narrow for outdoor living, especially if you are carrying – anything! 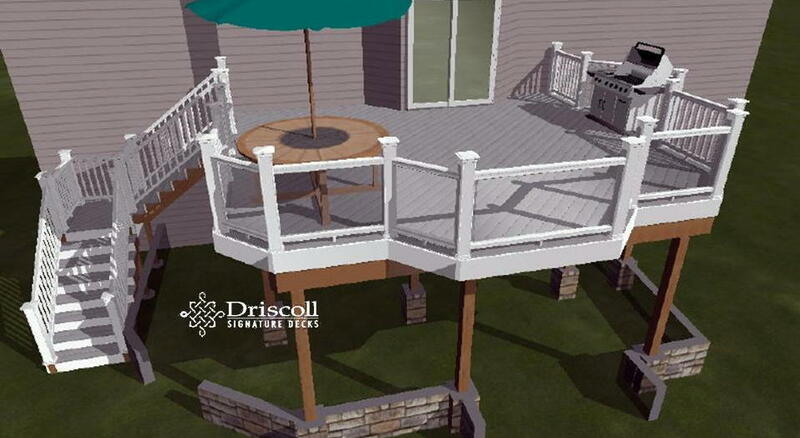 We developed our Signature 3-D design plan rendering in order to show you our customers, how your finished deck and paverstone patio below will look; because this way, we can get everything ‘perfect’ for you on paper – first, long before we swing the first hammer. 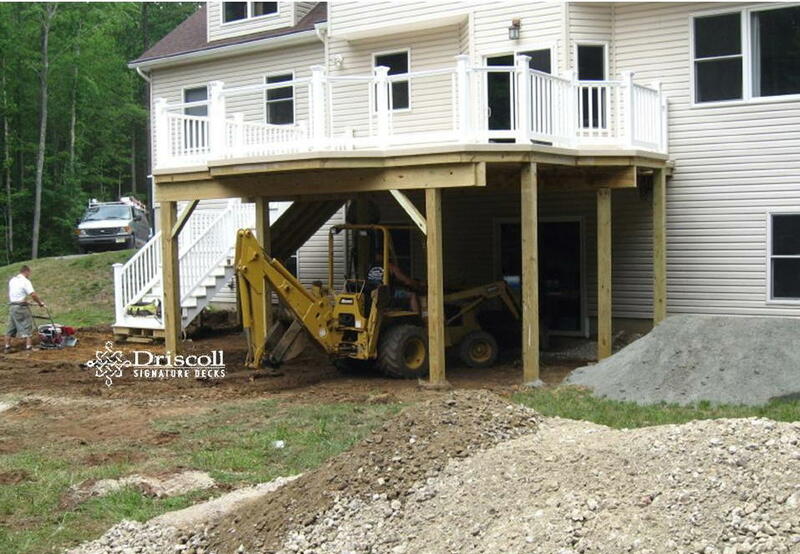 Normally, we design and build our custom decks to be on, as on top of the deck! BUT, not this one! 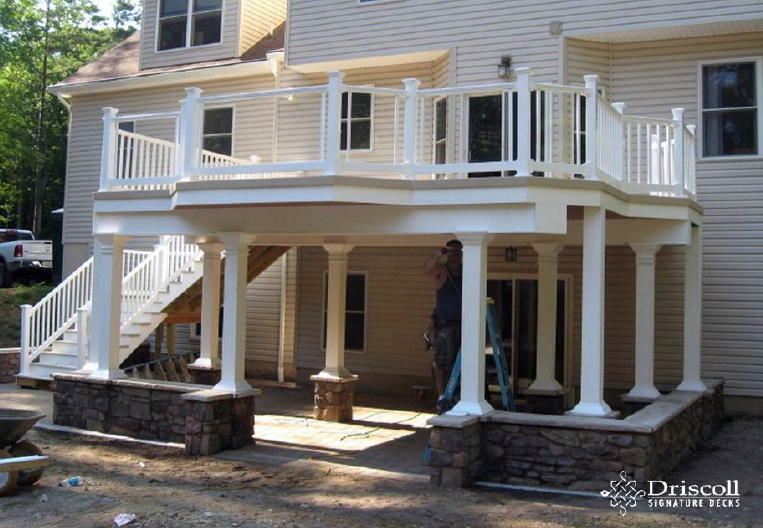 This was designed as a custom fiberglass deck, not only to enjoy being up on the deck surface, but also below it on the paverstone patio underneath the deck. But, as you can see, we first had just a wee bit of prep-work to do and needed to take 8″ of top soil out and pitch it away from the houseline (for water run-off into a 150′ drain pipe and dry well). This is probably the most ‘under deck’ design and work we have ever done, again most of our deck designs are to be ON, not UNDERNEATH! So, we built this deck with a fiberglass surface to make it water-tight. On the ceiling over the patio (or under the deck) we installed stained-vinyl-bead-board with high hats lighting and a couple of paddle fans – to keep you cool..! 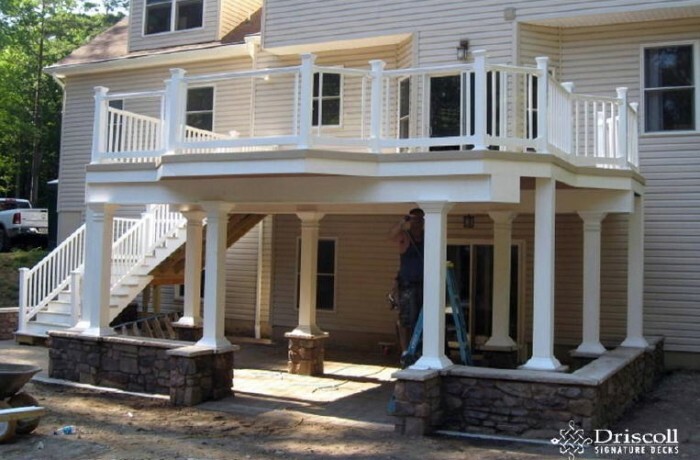 On the front section of the deck facing out into this big yard, we installed clear-view railings for an unobstructed ‘clear-view’ of their beautiful yard! 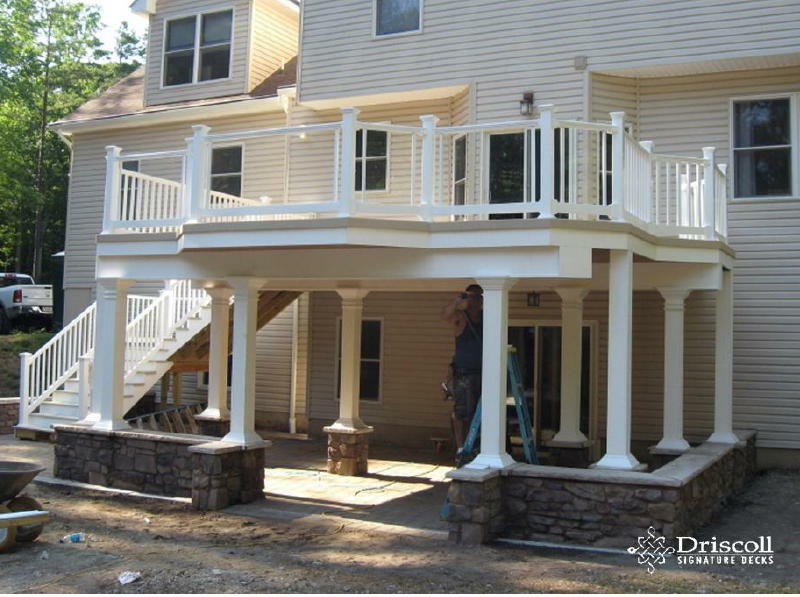 We also installed lovo accent lighting on the railing posts and stair risers, and a platform stairs for access to and from the paverstone patio AND you might also note the stone-circle and the columns with white-vinyl and stone-veneer and matching walls around the entire patio. Whew…!! 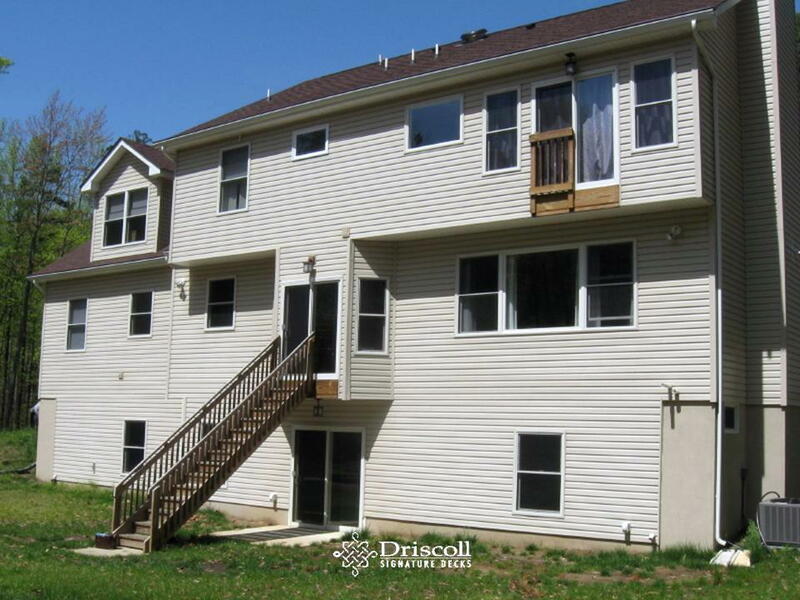 Now this is what we call a true – Driscoll Signature Deck!